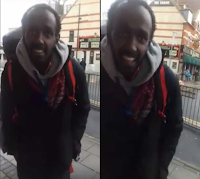 Wednesday, February 06, 2019- A homeless Kenyan man languishing in the streets of the UK has appealed for help. The middle aged man identified as Dan Mutungi from Machakos, has been in the UK since 1992. He was filmed by a Kenyan lady by the name Bancy Wairimu after he begged Wairimu for £10 (Sh1,295) to buy food. When she asked him what help he needed, he said food and shelter and stated that he lost his passport when the lady filming him advised him to return to Kenya. “This guy is a Kenyan based in UK, Luton to be specific, I cry to Uhuru and his government to help him go back home as he is leaving on the street begging, it’s really sad.